It’s that time of year again: I have about 20 pounds of carrots in my refrigerator from my Dad’s garden and our friends at Woven Roots Farm. I also have about as much free time as…wait, what’s that? Since the first week in September I have been busy and busier and I can’t complain about it one bit. 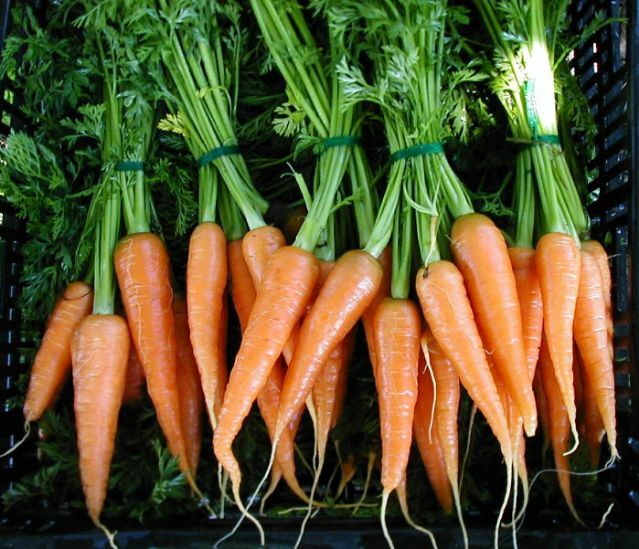 So this week’s recipe is all about carrots, and quickly! My husband Dana and my brother Brian and I started selling our Fire Cider in stores around the Berkshires last September. We have gotten so much support from so many people and local businesses (no, they are not the same thing!) all over the Berkshires and beyond: we are now officially in every state in New England and even Ohio. It’s been a pretty amazing year for the three of us. This fall for our one year anniversary we exhibited at the Big E for 6 days, handing out over 15,000 samples of our tonic. This has led to us working pretty much nonstop for the past 4 weeks and counting. One thing that has kept us going (aside from the Fire Cider, of course) has been sitting down for a home cooked meal together, at least a few times a week. I am so used to cooking almost all of the food we eat that it’s been kind of a shock all this eating on the go- grabbing prepared food at the Co-op or The Creamery and eating in restaurants at the end of a long workday, too tired to cook, or even go to our garden to harvest food. So I feel reassured that once again, home cooking with farm fresh foods is the way to go for health, best flavor and my sanity as well. Eating together is one of those things that is full of intangibles and is so very important to any family, be it your group of friends, your roommates or your parents, siblings and kids. When we eat together we have a chance, maybe the only time all day or all week, when we are all doing the same thing, at the same time, together. When we share a meal we have prepared together we share the energy and love we put into the food and we all receive the benefits. Eating together is community building 101. Speaking of the energy we get from our food, eating root vegetables helps me to to feel more grounded and connected to the earth, especially during times when I’m really busy! This easy soup recipe calls for 3 root veggies: ginger, onion and carrots with some fresh herbs for a very colorful and nutrient dense meal. This soup takes about 15 minutes of actual cooking time, with about 30 minutes of simmering and cooling, so make a double batch and save some for later in the week when you have less time to cook. You can use the downtime while the soup simmers to sauté some greens in garlic and olive oil for a well-rounded, brightly colored meal that will surely leave you and your family feeling nourished, brighter and healthier. 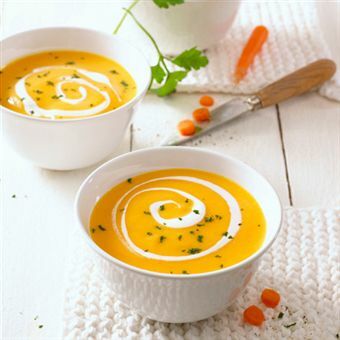 Carrot and Ginger Soup with a swirl of cream or coconut milk, perfect fall food! Heat the oil in a large saucepan over medium-high heat. Add the onion and cook, stirring occasionally, until softened but not browned, 5 to 6 minutes. Stir in the carrots, broth, ginger, salt, and pepper. Bring to a boil. Reduce heat and simmer until the carrots are soft, about 20 minutes. Let cool at least 10 minutes. Using a wand blender or a vented stand blender, puree the soup until smooth. Return to pot and warm, if necessary, over medium heat. If you want to add cream: whisk the cream in a small bowl until soft peaks form. Fold in a pinch of salt and chopped fresh herbs. Divide the soup among individual bowls and top with the herb cream. For the coconut milk: use organic, canned coconut milk (not the light stuff, it just has water added) and blend well so that it is smooth. Add the chopped herbs and serve the soup with ¼ cup swirled into each bowl. If you are on a strict no sugar diet, try making this version of the soup using lots of leeks and just a few carrots for color and mild sweetness.